If this is your first visit here, welcome! 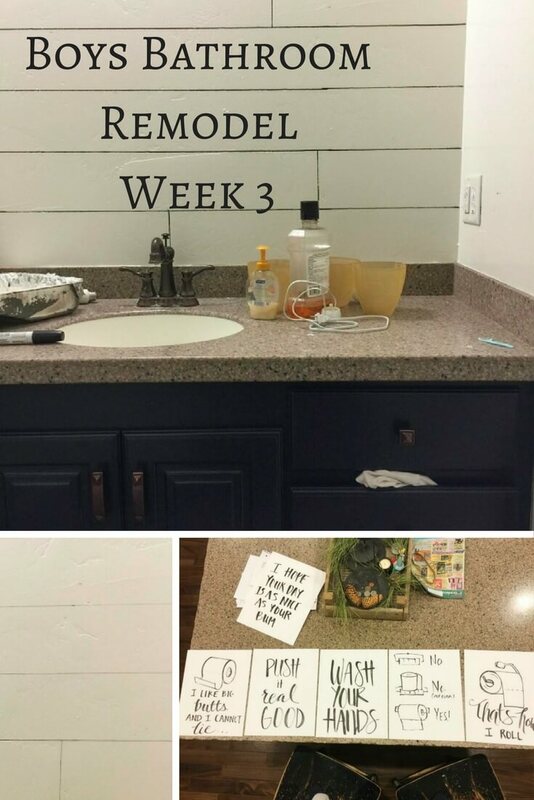 This is week 3 of a $100 dollar room makeover challenge. 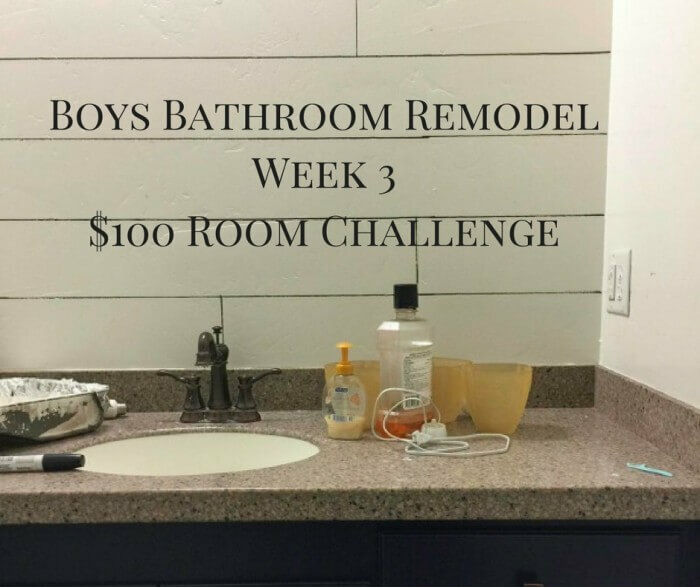 That is, $100 dollars to completely makeover a room, and I chose our boys bathroom. Here is a before picture from a few weeks ago as a reminder. Check out Week 1 and Week 2 if you want to catch up! Okay all, we are down to the wire! One more week and still lots to do! This boys bathroom remodel is progressing, but not as much as I would like. I am having decision paralysis. Guys, its my wall design! I keep jumping back and forth from one idea to the next. 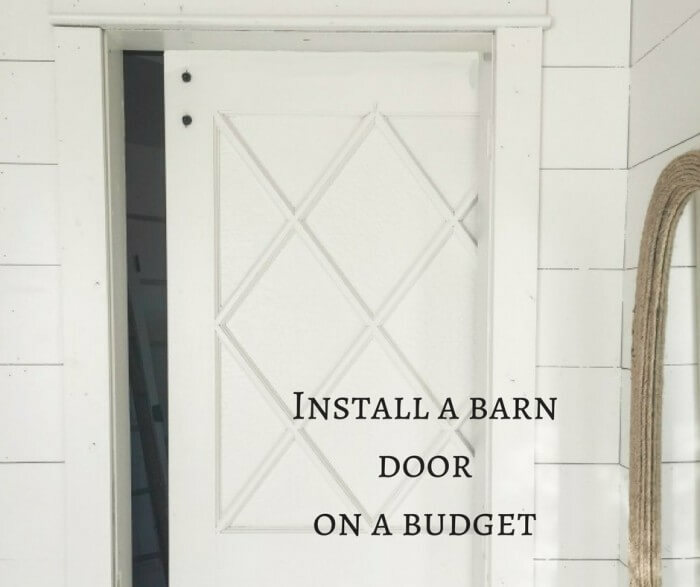 I really wanted to create a shiplap effect without having to install any shiplap, since it is not in my budget. I started with pencil to draw the shiplap design. I liked it, but I thought it needed more impact so I tried it out with my sharpie paint pen. Here are the two options. Keep in mind, both photos are pretty sad. This room has really bad lighting right now. Drawn with sharpie paint marker….. So, please, tell me, what do you like better? Is one better than the other? DO you hate them both? Ah! Please give me your thoughts! 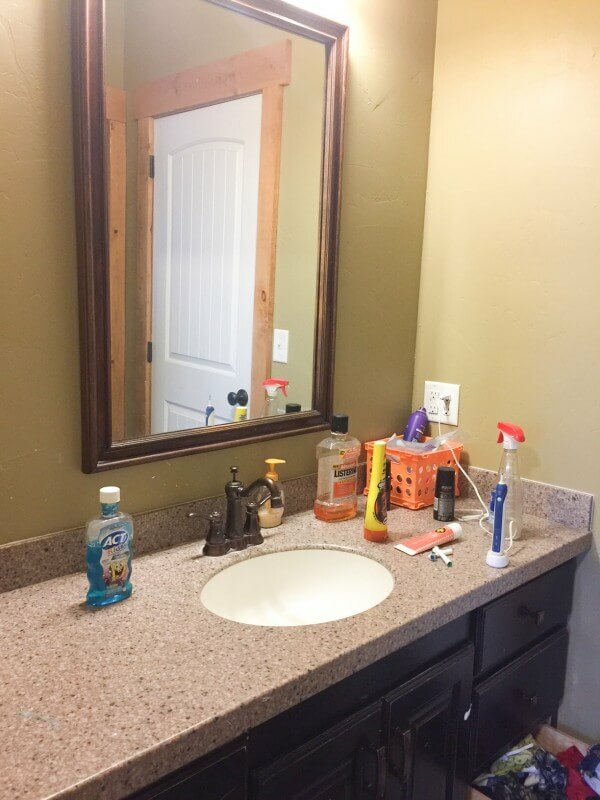 Now, while I am stuck on the wall design, I did manage to paint the cabinets, which we black and looked a little worn out. I painted them the same dark navy blue that I used on my kitchen island. It was left over paint so it cost me nothing to do. 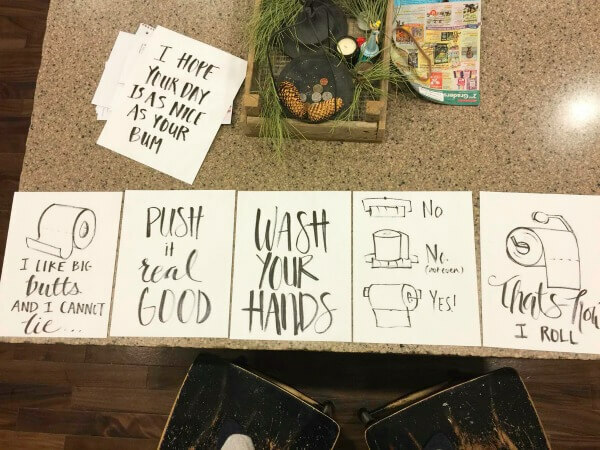 The other thing I have been working on were some fun and light hearted pieces of bathroom art that would be fun in the bathroom. I found some fun quotes and my kids all let out their heartiest laugh when they saw them! So I call that a win! I will either frame a few or mount them a different way. Which ones are your favorite? I am a big fan of the Push it real good! haha! And that’s all I have for you today! This boys bathroom remodel is getting close! Now, I will sit here and wait to hear your opinions on the wall treatment….its all up to you my dear friends! 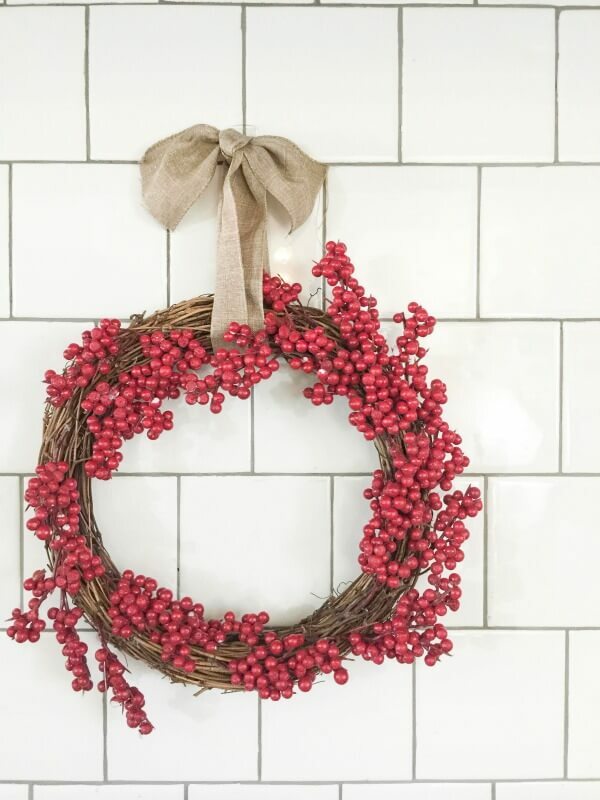 Make sure to check out all the other amazing bloggers linking up for this challenge. This link up is only for those participating in the link up, please do not add your own. Thanks! Where did you get the bathroom art?? it’s so cute and funny! I love it. as far as the wall goes, I prefer the pencil over the sharpie. the bathroom is looking good! Thanks Shelley! I actually drew the wall art! Wow!!!!!! It’s looking amazing so far! The art prints are hilarious!! My boys would get a kick out of them too. 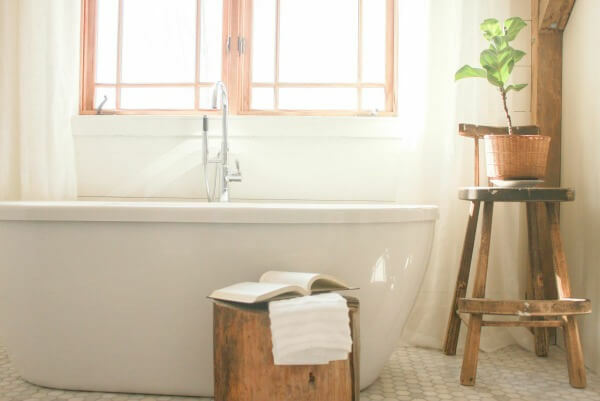 I think the faux shiplap is genius and would have never occurred to me. Great job and I love the navy paint. In fact I’m getting ready to paint a bar cabinet this weekend and I chose a pretty navy paint too. Looking forward to the reveal next week. And that’s what I like you, you are brilliant! I didn’t even think about drawing it on. I did however take a screwdriver to a painted paneling wall to make lines..lol. I love it and can’t wait to see what you choose. I think i like the sharpie pen better. The prints are amazing. Choosing only a few is not easy! Your artwork is hilarious and awesome! I love them all. 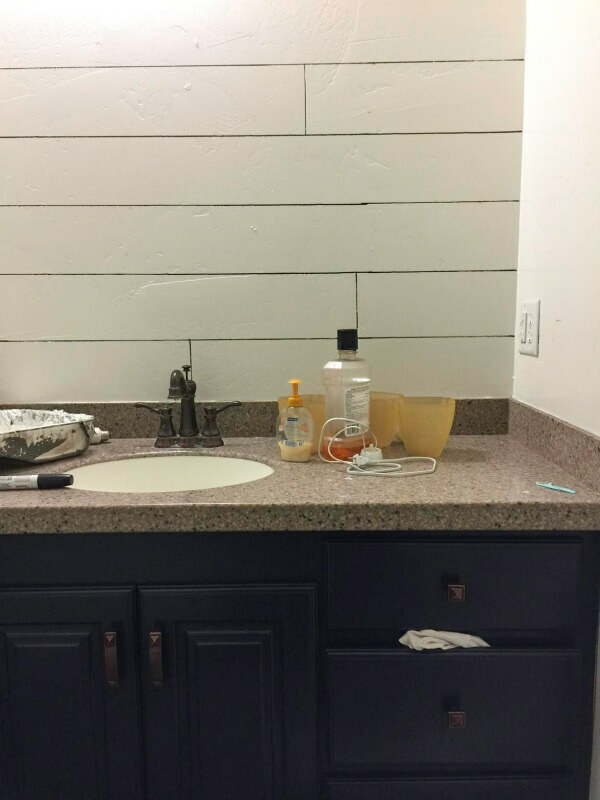 And the faux shiplap looks great. I like the sharpie version because it’s a bit more pronounced. I wonder if there’s a gray sharpie that would give you a compromise between the two options? It’ll look great whichever route you go. Those bathroom quotes are hilarious! I vote for the pencil version of the shiplap. Is it too late to say that? ? I’m pretty sure we have the same brain!! I just installed shiplap in my kids’ bathroom this week and I’ve been working on REALLY similar artwork! Not all the same as yours, but two of them are almost identical!! I might tweak some of mine now, so we don’t have the same projects, because I like yours so much more anyways! They are fantastic! Oh my gosh thats so funny! I cant wait to see yours! Those prints are too funny! Can’t wait to see it all together. 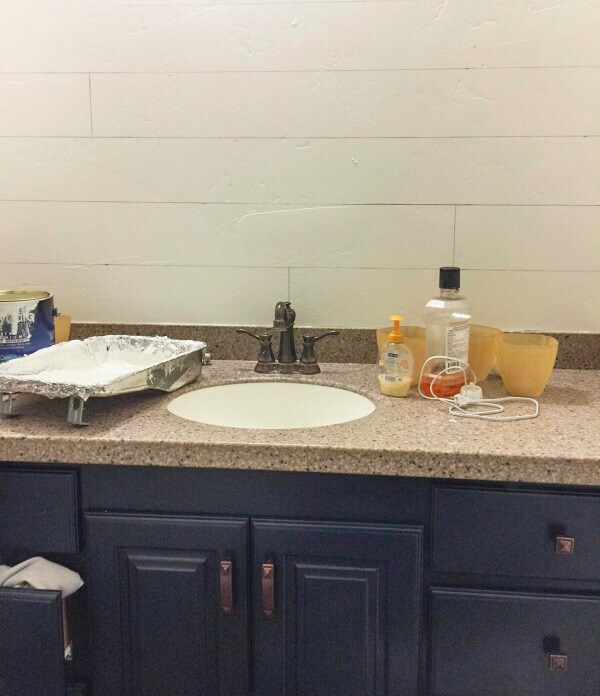 As for the shiplap, its hard to tell..but I agree with Erin, and would wait on it if your not sure. Lol….those printable are so perfect for boys. I’ll have to check back to see what the bathroom looks like. The wall art looks great! I also love what you did with the backsplash! 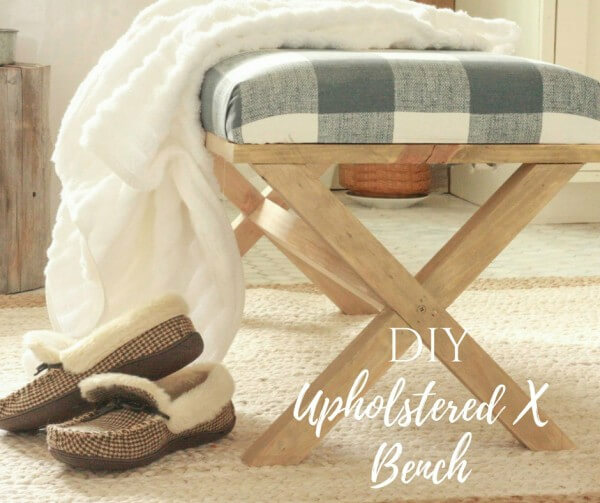 I just stumbled upon your blog and thought I’d say hello 🙂 We have a little something in common (well besides a love for DIY and decor). Does Market Theme ring a bell? Anyway, I love your blog! So many fun ideas. The bathroom prints are hilarious and I love the navy cabinets. Ha! Yes we do have something in common then dont we! So glad you stopped by!